The Summer of Magic Marathons just keeps getting hotter! The Pinelands Athletics Club & event organisers, Top Events want you to WIN big in the build up to the Hohenort 15km Road Race. Next week, Magic Music Radio will be giving away some amazing prizes each and every day. Listen in to every show to find out how you can win. 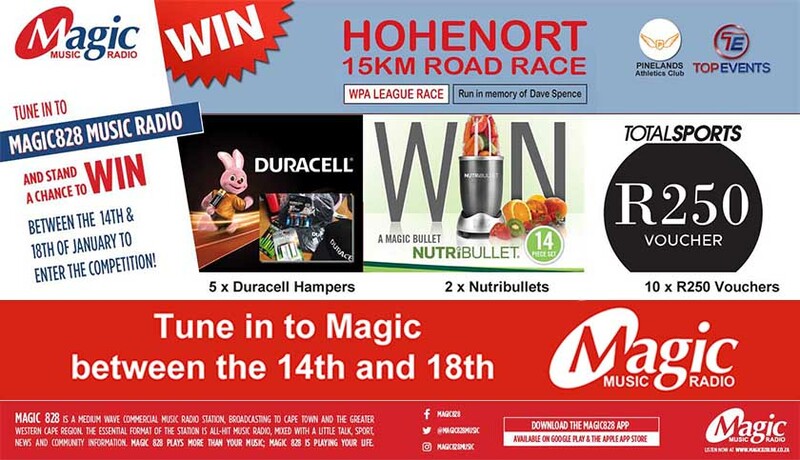 Listen to Magic Music Radio all next week and stand a chance of winning your share of over R10 000 worth of race sponsored prizes from Duracell and Total Sports. Don’t forget to join in on the fun of the Hohenort 15km Road Race where there will be even more chances to win spot prizes. You can find out how to Register by heading over to our events page, where you read up on all the important race information. The following information will be kept confidential and we ask for some additional information to personalise and better serve you - and all our listeners.